Hoboken Cove is a great spot for discovering marine species. Ribbed mussels, diamond-backed terrapins, eels, and sturgeon are just some of the wildlife people can get a glimpse of while participating in the 2019 City Nature Challenge in Hoboken this April. From Friday, April 26, through Monday, April 29, cities across the world conduct a four-day bioblitz in which citizen scientists document the diverse plant and wildlife species in urban environments. The challenge begins when participants download the iNaturalist app to a smartphone or tablet. App users will then take photos of the wildlife around them including insects, plants, trees, and animals. App users and experts from around the world help identify them. Once identified they become part of a database for scientists around the world. According to the City Nature Challenge website, the challenge started in 2016 when citizen science teams at the Natural History Museum of Los Angeles County and California Academy of Sciences in San Francisco wanted to capitalize on their cities’ friendly rivalry. During their eight-day competition, more than 20,000 observations were made by more than 1,000 people, cataloging approximately 1,600 species in each location. In 2017 the City Nature Challenge grew and became a national competition. In 2018 it became an international event. This year, more than 160 cities are scheduled to participate including Hong Kong, Buenos Aires, Barcelona, Denver, and New York City. While you can participate in the challenge on your own, Resilience Adventures will have stations set up near Hoboken Cove where participants can speak with people who have been trained in the iNaturalist platform and also learn about the bioblitz and local wildlife from local teachers and naturalists. They will have guidebooks and experts on hand to help identify the species that participants document. 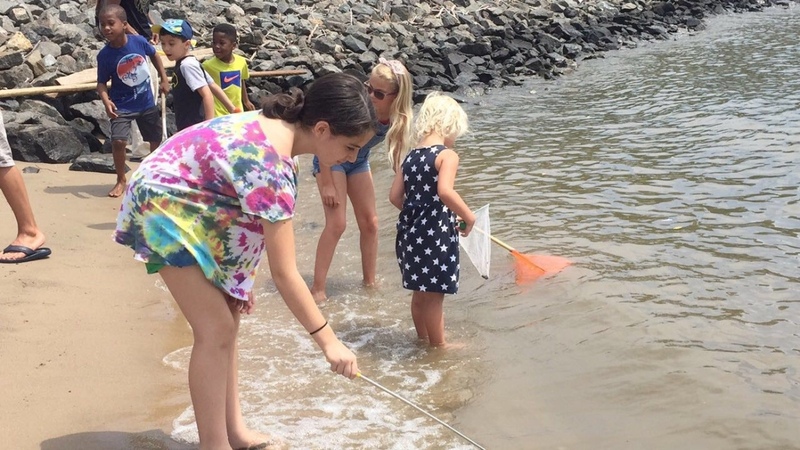 They will also lead a group of volunteers to document waterfront species at the Hoboken Cove Beach, lead family-friendly catch-and-release activities, and host workshops testing water quality on Saturday and Sunday from 10 a.m. to 2 p.m. Participants can wear hip waders and use nets and other collection devices such as traps to discover wildlife along the water’s edge. According to Thurlow, Hoboken Cove is a good location for finding various species because it’s part of the Hudson River Estuary. Despite its urban location, it has a rich and beautiful ecosystem. Hoboken’s waterfront has a long history of industrialization, but now there’s been a resurgence of wildlife. Thurlow said that old piers are becoming more like reefs as bivalves and other filter feeders make them their home. “There are a number of peer review studies that show that children and adults who build a connection to nature are more likely to engage in pro-environmental behavior,” said Thurlow, noting that often if people think of nature as being somewhere else, and far away, they do not do their part to recycle or realize that their ecosystem is interconnected. For more information on the City Nature Challenge go to http://citynaturechallenge.org/. For more information on activities hosted by Resilience Adventures, email info@resilienceadventures.org or call 201-477-8713.